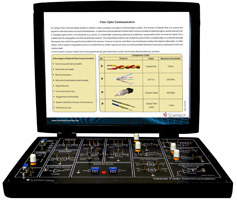 Optical fiber cables are probably the most promising type of guided transmission medium for virtually all forms of digital and data communications applications, including local, metropolitan, and wide area networks. With optical fibers, electromagnetic waves are guided through a media composed of a transparent material without using electrical current flow. With optical fibers, electromagnetic light waves propagate through the media in much the same way the radio signals propagate through Earth’s atmosphere. In essence, an optical communication system is one that uses light as the carrier of information. Propagating light waves through Earth’s atmosphere is difficult and often impractical. 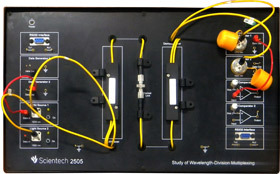 Consequently, optical fiber communications systems use glass or plastic fiber cables to “contain” the light waves and guide them in a manner similar to the way electromagnetic waves are guided through a metallic transmission medium. 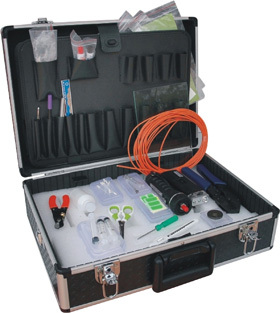 Optical fiber cables have, for all practical purposes, an infinite bandwidth. Therefore, they have the capacity to carry much more information than their metallic counterparts, or, for that matter, even the most sophisticated wireless communication systems. 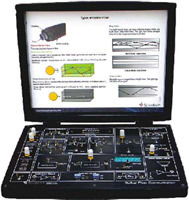 Scientech offers optical laboratory solutions from elementary to advanced topic. 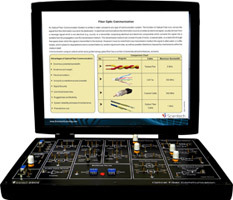 It will prepare trainee and students for today’s cutting edge optical fiber industry.